Robert F. Kennedy Jr. (foreground, right) visits Standing Rock on the #NoDAPL day of action Nov. 15, 2016. The Standing Rock Sioux tribe released a documentary Tuesday about their ongoing battle against the Dakota Access Pipeline. Mni Wiconi: The Stand at Standing Rock runs just eight minutes and details the eight-month fight to stop the pipeline. “Mni Wiconi” means “water is life” in Lakota, and it has been the theme of the protests against an oil pipeline that threatens the water supply of a people living along the Missouri River. There are scenes of police responding violently to the water protectors in North Dakota, and Native people tell the story of the impact of the pipeline in their own words. “This film tells the story of our prayerful and peaceful demonstrations by water protectors that have motivated thousands of tribal members and non-Native people around the world to take a stand,” the Standing Rock Sioux tribe’s chairman, Dave Archambault II, wrote on the official Facebook post announcing the documentary. 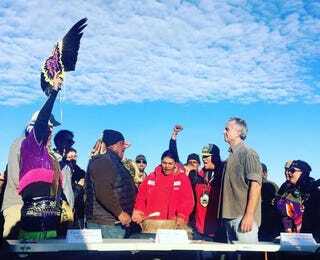 Indian Country Today Media Network reports that Robert Kennedy Jr. visited Standing Rock on Tuesday for the #NoDAPL day of action to extend his support in the fight against the Dakota Access Pipeline. “What Energy Transfer Partners is doing is a real environmental crime,” Kennedy said. Kennedy is senior attorney and president of the Waterkeeper Alliance, a nonprofit organization focused on the right to clean water. He was joined at Standing Rock by a panel of other environmentalists, including Michael Brune of the Sierra Club and Kandi Mossett and Joye Braun of the Indigenous Environmental Network. Kennedy spoke about the need to divest from fossil fuels. On Wednesday the Department of the Interior canceled 15 oil and gas leases in the Badger-Two Medicine area of northwest Montana, on land that the Blackfeet Nation considers sacred. Secretary of the Interior Sally Jewell said that she was righting a historic wrong in retiring the leases, which were granted in the 1980s under the Reagan administration. At an event in her office Wednesday, she said that she was sorry it took so long to get to this point and added that the leases should never have been allowed. “I’d like to say it’s a victory for the Blackfeet tribe, but it’s not. It’s a victory for the people of Montana; it’s a victory for the people of the United States and the world,” said Harry Barnes, chairman of Blackfeet Nation.